Goldman Sachs and UBS joined the four existing members of the century-old London Gold Fix in the new London Bullion Market Association (LBMA) Gold Price electronic replacement, LBMA said. China, the world’s largest consumer of gold, has been snubbed. 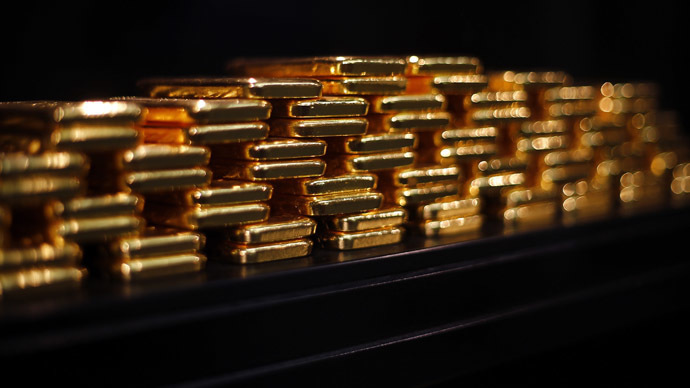 Goldman and UBS joined Barclays, HSBC, Bank of Nova Scotia and Societe Generale, as participants in the new London Bullion Market Association Gold Price benchmark, LBMA reported on Friday. The first LBMA Gold Price settled at $1,171.75 an ounce under the new system. The electronic gold price replaced a system unchanged for nearly a century. The world’s second largest economy, China, was expected to participate directly in setting the new price fixing. However, no companies from China have been confirmed, although Chinese banks were among those in talks to take part. Chinese players may be added in the future, Finbarr Hutcheson, president of IBA, was cited as saying at a press meeting in London earlier on Thursday by Bloomberg. No Chinese companies have ever directly participated in the nearly 100-year-old fixing while gold demand in China, last year’s second-biggest bullion buyer, has more than doubled since 2009. The country is expected to consume almost half the world's gold output by 2020. The new method for fixing the gold price daily replaced the so-called London Gold Fix, a widely-used pricing medium that has been around since 1919, LBMA said. Gold is the last of the precious metals to switch to an electronic platform. “For the first time market participants will be able to see the amount of gold that is traded during each auction, and there will be historical records of all trading that can be scrutinized by them and regulators,” Finbarr Hutcheson, president of ICE Benchmark Administration Ltd., a unit of ICE, was cited as saying by Wall Street Journal. The electronic auction process for setting the gold price is designed and expected to be transparent and to allow as many participants as possible. The new method will probably be a better means of price discovery and will increase participation, John Butler, chief investment officer for Amphora Capital, told RT on Friday. “The participants in the gold market will be more confident that these fixing prices determined in London will simply better reflect the true global price of gold and that confidence they are getting. A fair, more transparent price could invite some additional people into the gold market who previously were skeptical that the information they were receiving was indeed reliable,” Butler said. The gold market has a daily turnover of about $150 billion, making it the largest precious-metals market. The London Gold Fix has been administered by London Gold Market Fixing Ltd. twice daily and determined by just four participants that set it for the last time by private telephone conference call on Thursday. The Intercontinental Exchange Inc. (ICE) will manage the gold price on behalf of the LBMA. The gold price will be set twice daily as previously.